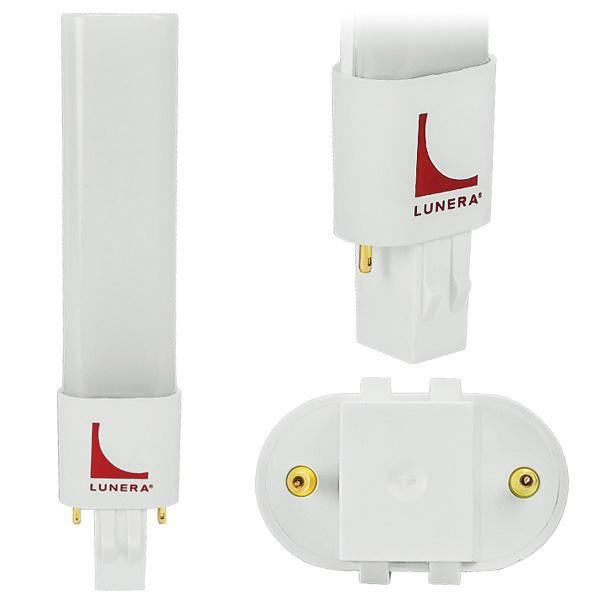 Lunera Gen3 Helen 5-Watt GX23 bulb base LED lamp in white color, offers 535-Lumens of light output. It has voltage rating of 120 - 277-Volts. This dimmable lamp featuring thermoplastic housing, has color rendering index of greater than 80. Lamp with 4000K color temperature rating radiates white light to the surrounding. This lamp has average life of 50000 hours. It measures 1.18-Inch x 0.63-Inch x 6.01-Inch. It supports both plug-and-play ballast driven installation and ballast bypass installation. It is perfect for downlights, sconces and open/fully enclosed fixtures. Lamp withstands temperature rating of -40 to 40 deg C. Lamp is UL listed and RoHS compliant.